Thirty years on, it’s hard to contextualize how far beyond the pale it was to hear these artists on commercial radio in America’s heartland at a time when the charts were dominated by Bruce Springsteen, Phil Collins and Tina Turner. Nowadays even your mom probably likes something by R.E.M. but in 1985 they were still two years away from breaking into widespread awareness. (The Cure were four years away; Depeche Mode, five. The Pixies weren’t even a seed of a band until 1986.) 97X was also first in its market to play songs that would later cross over to Top 40 radio, like “Walk Like An Egyptian”. It’s a cliché that the ’80s was a bad decade for music. Since I had 97X, my opinion couldn’t be more different: I’m still captivated today by the range of unexpected sounds that came from my radio back then, most of which holds up strikingly well. So here, warts and all, is a time capsule of “The Future of Rock and Roll”. Some tracks from 1984 are included for historical accuracy; they were still in rotation at the time, and included on the annual list of listener favorites compiled by the station. A handful of tracks are relatively unique to the Ohio-Indiana-Kentucky region, and even unique to 97X itself (like “Black Concert Tee Shirt” by Chem-Dyne, a garage punk band featuring two of the station’s DJs). Thanks to Craig Froehle for reference material, Jude Hayden for filling in some gaps, Doug and Linda Balogh, and the station’s staff from that era: Dan “Danny Crash” Reed, Robin Plan, Steve Baker and the late Ken “Mr. K” Glidewell. This is fantastic. I had discovered some of these as I was graduating high school in 1985, arriving in college (with a “college rock” radio station) just in time. Great trip down memory lane. Yes, that’s exactly what 1985 sounded like for me. For 20 years I saved one of the early blue pill-shaped bumper stickers and finally, in 2005, put it on a car I expected to own for a good long time. I was immediately rear-ended and lost that bumper. Hubris. Mark, I had a pink 97X sticker on my car and got rear ended. When I got my next car I put a blue one on it and was rear-ended a week later. I still have one of the blue ones, but it is safely encased in a WOXY shadowbox. I was a freshman in Oxford fall of 85, those tunes were literally the sound track of my life. A lot of those tunes have never left me, a few I can live without, but the memories of those days and nights tuned in to WOXY are priceless. An Oxford native teenager of the 80s and eventually a Miami Grad, WOXY was a big part of my life. Those were the days! In Baltimore, there was a family-owned radio station called WHFS that had a free-form format; they used to play all of these wonderful songs. They also introduced me to glorious music by David Sylvian. I so miss that station! It was eventually taken over by corporate radio. This kind of music helped me survive and thrive and find myself. I loved, loved, loved WHFS. Most of the songs on this playlist I heard on ‘HFS. I’m now a DJ on KHUM in Humboldt County, CA, and I program my show in the spirit of free-form WHFS. I went to GMU in Fairfax, Va. When my fraternity brothers introduced me to WHFS I could wait to turn the radio on. I would keep a pen and paper in my car so I could write down the artist. I would then hit the music store and go to the imports section. Exactly how I was with WOXY. I once grabbed an ATM receipt to write an artist/song on the back, and kept adding to that same piece of paper in the world’s tiniest handwriting until there was no space left. I only discovered WOXY in the late 2000s, when that station was reincarnated as an Internet radio station. I loved it immediately, being in Austin, surprised that there weren’t (and still aren’t) any really great stations here. When they finally moved here, I was stoked. And when they went off air, I just about cried. I wish this station came back so badly! Love this! I used to listen to 97X a hell of a lot. I still have a couple of tapes that we taped off the stereo from the 90’s that we will still listen to…. Dan Reed is still on the air at Philly’s WXPN, as well as co-hosting the Dan And Dan Music Podcast. Robin Plan is in Austin, Steve Baker’s still in Oxford, but sadly Mr. K is no longer with us. Check out the bottom of the post for links to everyone’s Twitter accounts. Oh MAN!!!!! 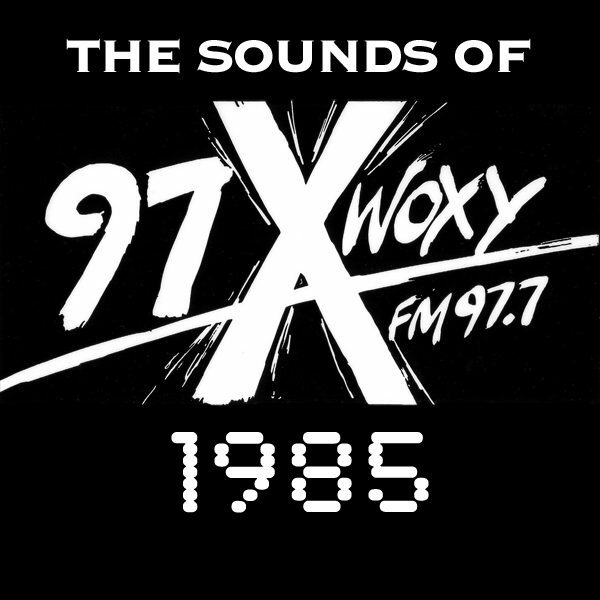 WOXY was, and still is, my favorite radio station. I have in my possession several HUNDRED hours of 97X’s Six Packs, in which a band or a topic was the subject of six songs. Holy cow! I loved the six packs; so much fun to come up with them, or second-guess what songs would be in a set. What would it take to convince you to digitize those and post them on Soundcloud? The promise that I’d be your best friend forever? And Request the X Night, an hour of taking requests, the rest of the night through the wee hours playing them back. I moved to Cincinnati in ’86 from coastal VA. It was like stepping into a bad time machine. People in denim jackets with mullets. Record stores full of Iron Maiden and bad classic rock posters. When I met other musicians and mentioned the artists I was into they’d look at me like a confused dog, they had no idea what I was talking about. Then I found 97X, which was a lot like William & Mary’s campus radio, which I had left. Suddenly my soundtrack was back on the right station. I became friends with Doug B but lost track of him a few years after he retired and moved west. Anyone know how he’s doing these days? Hey, Dennis. I’m afraid I never met Doug but, judging from the photos on his Facebook page, he appears to be enjoying himself; lots of beautiful sunsets over the Pacific. He’s living in Sonoma Co., north of SF. Remember the Modern Rock 500?!? And I was so proud that my brother was a DJ there for a while. One note – Royal Crescent Mob’s song is titled Get *On* the Bus, not Get Off the Bus. I wish the recordings had all the local commercials and DJ banter with it….oh well. Janet Planet, Danny Crash, et al, as a sophmore in HS in ’85 you were everything, (along with Handsome Clem Carpenters “Search & Destroy sur la WAIF en Cincinnati). Dedicated listener here. You changed my world and made it a better place. Danke. My wife, young son and I moved to Oxford during the summer of 1986 because I took a job in the local hospital’s lab. I immediately fell in love with 97X, as it was a refuge from the banality of Cincinnati/Dayton radio. The station was by far the best radio station I had heard since listening to an Indianapolis station in the mid-70s called WNAP. But, the artists I discovered on 97X remain the artists that I continue to listen to this day. Thanks for the great article! The people are saying it. This wasn’t just a radio station, was it? Thanks so much for sharing this incredible set. I was from Louisville, in Cincinnati for the summer of 1985 for work. WOXY was the sonic wallpaper of my life for three months, always on in my car and back at the apartment. Someone with a clue started piping WOXY through the PA system at work in the morning, at a point, before muzak was turned on. It is no exaggeration to call it a life and senses-enchancing station. I was one of those who hung on it’s every sound. Oh how I miss WOXY in the 1980’s. I grew up in Blue Ash and didn’t always get the best signal but this station was my soundtrack to new music, old favorites, and concerts. It is such a fabric of who I am. I went to (a private grade) school across the street from the station during these years… they are linked so much to my youth, thank you for this. Thank you thank you thank you for making these available. Wow! I won a 97x contest in 1994 or 95 and got to introduce Depeche Mode at Riverbend Music Center along with front row tickets. Incredible! WNKU 89.7 morphed into a very close second to 97x and then we lost it last year. It was like losing WOXY all over again… painful. Very cool memory. I also won a bunch of stuff from the station: tickets to see Tears for Fears at Riverbend on the Songs from the Big Chair tour, records, a digital watch… the benefit of having my ear glued to the radio for as many hours of the day as I could manage. And yeah, it was sad to see WNKU meet that fate. I was but a wee child in the backwaters of Mason when it was still nothing but the town by Kings Island. I loved the new wave sounds on MTV, but nobody in Cincinnati was playing the best stuff on the radio. Then an older classmate told me about 97x. It was hard to get reception, being so close to the giant WLW tower in the middle of town, but if the weather was good and you got the antenna just right, you could enjoy the future of rock n roll right in your room. I wish that I had taped it, but this list brings back a lot of good memories. Thank you.